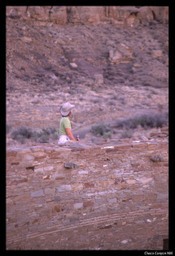 Chaco Canyon always inspires me to look deeper into myself. So do wakeup calls. And we never know when our next wakeup call will be. My family's latest was just this month. That's when my Dad nearly drowned. Dad and his race committee partner were a couple of miles out to sea on their patrol boat picking up racing buoys after a sailing race was cancelled due to bad weather. Seas were lumpy at 3 to 4 feet. Ocean temperature was icy cold at less than 50 degrees Fahrenheit. Definitely not swimming weather. When the engine would not start, seawater came in over the stern in the heavy seas. The bilge pump stopped draining the water as it should, and water collected in the transom. Next thing he and his partner knew, the boat capsized and turned completely upside down without warning, and they were thrown into the icy water. Dad went straight down -- he was in the water so quickly he had no time to pull the cord to inflate his life vest (note: bad llfe vest design for situations like this; get positive flotation vest). With no idea which way was up, he was afraid he might even end up under the upside down boat, unable to get to the surface. He still has nightmares about trying to get to the surface. His partner's vest had inflated automatically upon hitting the water - different design, very expensive. He stayed at the surface. How long can you last in 50 degree water? I don't know, but it isn't long when you are also struggling against heavy seas, rapidly losing energy, and are 84 years old. They are convinced they are alive today only because their sister patrol boat was close by to rescue them immediately. And it was only close because Dad had called them to come pull them away from the rocks when they had engine trouble. Thank goodness. I had arrived home for a week-long visit only 2 hours after he made it to shore that day. Boy, was I happy to see him. I was reminded of my deep appreciation for the simplest pleasures, and for every minute I get to simply be with my family and loved ones. What else can I say? Just this: Happy Father's Day, Dad -- I'm happy that you made it home that night so I could tell you how much I love you. And I am thankful for every minute we get to share. Next time we need a wakeup call, though, how about skipping the cold water swim? I am inspired by my Aunt Joy. She has been around for 90 glorious years, and is still going strong. Her entire extended family gathered recently for a grand weekend of celebration for her birthday. That's her in pink in the photo (which includes only a portion of the clan). Four generations were represented. 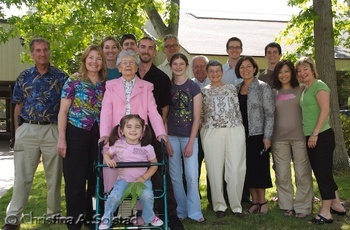 Can you pick out the youngest, her adorable great granddaughter? 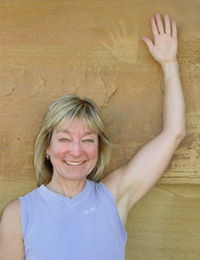 Joy has had two wonderful marriages, and has outlived both husbands. Both are great love stories. The first, my Uncle Bob, she met after being sent away by her mother so she would come to her senses and realize her then-fiancee was not the right man for her. Instead, she met my uncle, they fell in love, and were married within a few weeks! She married her second when she was 80 or 81 and he was in his late 80s. She had nabbed the most eligible widower in her retirement community. The local newspaper did two big spreads on them: their wedding, on Valentine's Day, and a follow-up some time later. They were the talk of the town. She feels completely blessed for all she has in her life. She's been through a lot too. She rolls with what life gives her, and makes lemonade from the lemons. She's been through bankruptcy, and losing two men she loves. She is full of appreciation. Every time I visit her, and everything I do for her, she is full of gratitude. She is accepting of others. She is always helping others. She is also good at allowing others to help her. She is clear what she wants. Look like some pretty good life lessons to me. I'm sure my cousins, my mom (her sister), or other family members have things they can add. So here's to you, Joy. Thanks for being such an inspiration to your family and friends! 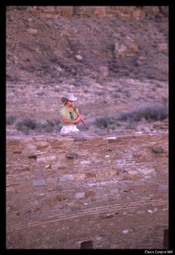 I have always connected the beautiful sound of the Native American flute with Chaco Canyon. Listen to R. Carlos Nakai and the wondrous music he makes with his many flutes. 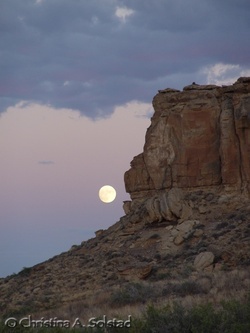 Since having my own, playing at Chaco is something I must do. 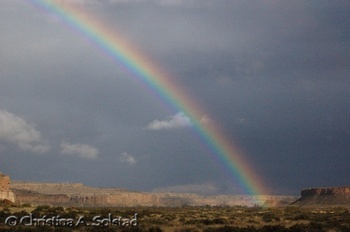 In June 2006, I met a couple of photographers who were enjoying Chaco. Unbeknownst to me at the time, one of them (Dave Baiocchi) took photos of me playing my flute, and pausing to take in the stillness, at Casa Rinconada. He was kind enough to send them to me. Thank you, Dave! I love these photos, because they remind me of how connected and happy I feel when I play.